Anyone who reads our blog on a regular basis probably knows that as a general rule, I don't do djent metal. This is much less a rule than a guideline, so there are bound to be some exceptions. 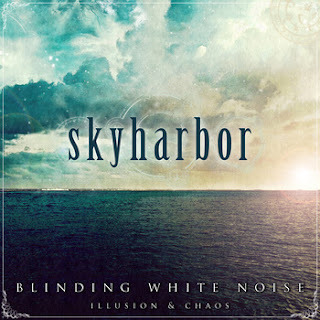 Skyharbor's latest album is such an exception. Here is why I am making an exception for this album: This disc is less djenty and 'core' than 99% of the scene bands in existence. If you are unsure what a 'scene band' is, let me try to explain it in layman's terms. A 'scene band' is a band whose music conforms rigidly to a set of stylistic standards within a certain sub genre, or 'scene'. While this album is certainly a metal album, it does not fall back on the metalcore crutch that many djent bands do and in fact includes syncopated djent riffs as merely a backing to the rest of the music, which in retrospect hardly sounds metal at all. The full title of this album is "Blinding White Noise: Illusion & Chaos". It is essentially a two-part album where most of the tracks come with the Illusion prefix and the final three carrying the Chaos prefix. The Illusion tracks are exceptional progressive-styled rock tunes that drift on auras of grandeur line thin, wispy clouds scooting across the sky. Vocals on these tracks are surprisingly melodic, using vocal effects to stretch some notes. These tracks are obviously meant to take on an illusory tone. Conversely, the final three tracks, the Chaos tracks, are more up-front metal approaches, mixing in fewer of the stretched vocals and introducing screamed vocals for the first time. These harsher vocals are carried out tastefully and do not invade the overall atmospheric content of the album as a whole, only further enhancing that atmospheric qualities.